A top engineer from the city of Los Angeles visited Cornell University this month as researchers tested a new earthquake-resilient pipeline designed to better protect southern California’s water utility network from natural disasters. They ran multiple tests, including an earthquake simulation in which a 28-foot-long section of the pipe was outfitted with more than 120 monitoring instruments and buried within 80 tons of soil – an experiment that took over a month for the research team to prepare. 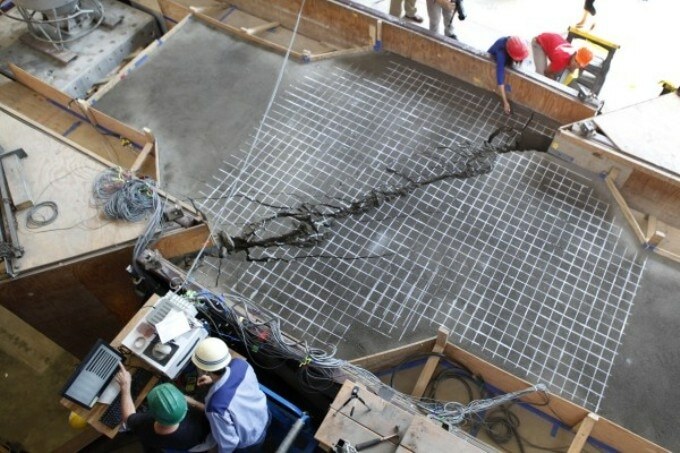 The test mimicked a fault rupture that can occur during an earthquake when global plates begin to slip past each other, causing the ground to shift and deform. A large, hydraulically powered “split box” imposed 2 feet of fault rupture along a 50-degree angle, forcing the buried pipeline into a combination of compression and bending. “The pipe was able to accommodate the 2 feet and didn’t spring a leak,” said Brad Wham, a geotechnical engineering postdoc from Cornell who designed the test, which was performed at the Cornell Geotechnical Lifelines Large-Scale Testing Facility. “We took the pipe to three times its current design standard, and it continued to convey water. So we consider it a successful test and very promising technology.” And while the test pipe was only 8 inches in diameter, Wham says the results are scalable and could be applied to pipelines as large as 70 inches in diameter or greater. “It surpassed expectations,” said Tom O’Rourke, professor of civil and environmental engineering at Cornell University and the project’s principal investigator. The steel pipe, developed by JFE Holdings in Japan, uses a unique structural wave design to control buckling, allowing the pipe to bend and compress without rupturing or losing water pressure. The wave features are installed at key locations along the pipeline to absorb large ground deformation, such as movements imposed by earthquakes and landslides or from undermining associated with scour during hurricanes and floods. The extent of its performance was unknown until it arrived at Cornell. The results are significant for Los Angeles and other West Coast cities that want to upgrade their aging utility systems, especially portions that cross over fault lines. Craig Davis, the resilience program manager for L.A.’s Department of Water and Power, attended the testing and said his city’s water utility system – the nation’s largest – crosses over 30 fault lines en route to supplying water to more than 4 million residents. The new pipe produced by JFE Holdings now gives Davis and other engineers a new option for securing water supply to the city’s most vulnerable areas. Following the fault rupture test, the research team spent three days carefully excavating the pipeline and will begin collecting additional data based on its deformation. The results will help officials identify the most strategic locations for the new pipeline to be installed. Los Angeles is not the only city to benefit from Cornell’s unique testing facility. San Francisco has implemented fault rupture hazard solutions for pipelines validated by Cornell, with Portland, Seattle and Vancouver all considering upgrades based on recent test results.